American novelist Louisa May Alcott was born November 29, 1832.She is best known as the author of the novel Little Women and its sequels Little Men and Jo’s Boys.Raised by her transcendentalist parents, Abigail May Alcott and Amos Bronson Alcott in New England she grew up among many of the well-known intellectuals of the day such as Ralph Waldo Emerson, Nathaniel Hawthorne, and Henry David Thoreau. Nevertheless, her family suffered severe financial difficulties and Alcott worked to help support the family from an early age. She began to receive critical success for her writing in the 1860’s. Early in her career, she sometimes used the pen name A. M. Barnard. Among his best known novels is The Pilgrim’s Regress, which was written in 1933 shortly after he converted to Christianity, this depicted his experience with Christianity in the style of John Bunyan’s The Pilgrim’s Progress. Lewis also wroteThe “Space Trilogy” (also called the “Cosmic Trilogy” or “Ransom Trilogy”) which dealt with what Lewis saw as the de-humanising trends in contemporary science fiction. The first book, Out of the Silent Planet, was apparently written following a conversation with his friend JRR Tolkien about these trends. Lewis agreed to write a “space travel” story and Tolkien a “time travel” one, but Tolkien never completed “The Lost Road”, linking his Middle-earth to the modern world. Lewis’s main character Elwin Ransom is based in part on Tolkien, a fact Tolkien alludes to in his letters. The second novel, Perelandra, depicts a new Garden of Eden on the planet Venus, a new Adam and Eve, and a new “serpent figure” to tempt them. The story can be seen as an account of what could have happened if the terrestrial Eve had resisted the serpent’s temptation and avoided the Fall of Man. The third novel, That Hideous Strength, develops the theme of nihilistic science threatening traditional human values, embodied in Arthurian legend.Many ideas in the trilogy, particularly opposition to de-humanization as portrayed in the third book, are presented more formally in The Abolition of Man, based on a series of lectures by Lewis at Durham University in 1943. Perhaps C.S.Lewis’s best known novels are The Chronicles of Narnia which are a series of seven high fantasy novels and are considered classics of children’s literature. Set in the fictional realm of Narnia, a fantasy world of magic, mythical beasts, and talking animals, the series narrates the adventures of various children who play central roles in the unfolding history of that world. Except in The Horse and His Boy, the protagonists are all children from the real world, magically transported to Narnia, where they are called upon by the lion Aslan to protect Narnia from evil and restore the throne to its rightful line. The books span the entire history of Narnia, from its creation in The Magician’s Nephew to its eventual destruction in The Last Battle. . The Chronicles of Narnia have also been adapted for stage, TV, radio, and cinema.Inspiration for the series is taken from multiple sources; in addition to adapting numerous traditional Christian themes, the books freely borrow characters and ideas from Greek, Turkish and Roman mythology as well as from traditional British and Irish fairy tales & have profoundly influenced adult and children’s fantasy literature since World War II. However Lewis’s exploration of themes such as religion, race and gender have caused some controversy. Lewis sadly passed away on 22 November 1963, as the result of renal failure, one week before his 65th birthday. Media coverage of his death was minimal because it was the same day that U.S. President John F. Kennedy was assassinated, and Aldous Huxley, died. Lewis continues to attract a wide readership. In 2008, The Times ranked him eleventh on their list of “the 50 greatest British writers since 1945”. Readers are often unaware of what Lewis considered the Christian themes of his works. His Christian apologetics are read and quoted by members of many Christian denominations. Lewis has been the subject of several biographies. In 1985 the screenplay Shadowlands by William Nicholson, dramatising Lewis’s life and relationship with Joy Davidman Gresham, was aired on British television, starring Joss Ackland and Claire Bloom. This was also staged as a theatre play starring Nigel Hawthorne and made into the 1993 feature film Shadowlands starring Anthony Hopkins and Debra Winger. In 2005, a one-hour television movie entitled C. S. Lewis: Beyond Narnia, starring Anton Rodgers, provided a general synopsis of Lewis’s life. There is also A bronze statue of Lewis’s character Digory, from The Magician’s Nephew, stands in Belfast’s Holywood Arches in front of the Holywood Road Library. I would like to read ‘O. Winston Link: Life Along the Line.’, which contains An incredible set of historic photographs captured during the dying days of steam engines in the United States. The photos were all taken by photographer O. Winston Link and show the Norfolk and Western, America’s last major steam railroad, as it was switching its operations to diesel in the 1950s. Mr Link’s stunning shots also capture the industry before the triumph of the car and the airplane brought an era where railroads dominated passenger travel to an end. The book includes more than 180 of the photographer’s most famous works as well as rare never-before-published images. The superb pictures also capture a small-town way of life that was about to experience massive shifts and, in many cases, disappear completely.Mr Link’s mostly black and white images offer a moving account of the people and communities surrounding the last steam railroad ever seen in the U.S. The Dark Knight Rises is released on DVD on 3rd December 2012. Directed by Christopher Nolan, the film stars Christian Bale as Batman, Gary Oldman as Commissioner Gordon, Tom Hardy as Bane, Anne Hathaway as Catwoman, Joseph Gordon-Levitt as police officer John Blake and Michael Caine as faithful butler Alfred. The film starts eight years after the events of The Dark Knight, when Batman (Christian Bale) vanished into the night, Assuming the blame for the death of DA Harvey Dent (who went insane after an unfortunate accident and became the villainous Two-Face). Since stopping Two-Face, Wayne has been living a self-imposed Howard Hughes-like existence in his Manor. Luckily Criminal activity in Gotham City is at an all-time low having been crushed under the weight of the the draconian anti-crime Dent Act, which was passed in the wake of the Joker’s crime spree, the city’s streets have been cleaned up, and the need for a costumed crime fighter is no longer the priority it once was. However everything changes with the arrival of a cunning cat burglar named Selina Kyle (Anne Hathaway) who manages to infiltrate Wayne Manor and swipes a priceless necklace and once again Bruce finds himself spurred back into action as the Caped Crusader. However things go from bad to worse when a really dangerous and rather large masked, terrorist, named Bane (Tom Hardy) manages to escape from a prison in central Asia and later turns up in Gotham issuing a call to arms to the recession-struck citizens of Gotham, to rise up against businesses and institutions that grew fat at their expense and then proceeds to cause even more chaos by freeing all the violent inmates at Gotham’s Blackgate Prison during a riot. Batman soon finds himself called into action again trying to stop Bane and his violent rampaging cohorts, however just when he thinks he might be in trouble he discovers that he has allies in the form of Miranda Tate (Marion Cotillard) and John Blake (Joseph Gordon-Levitt), a beat cop whose integrity impresses Commissioner Gordon (Gary Oldman) and who becomes a key figure in the fightback against Bane’s weaponised masses. Best known for her portrayal of Amelia “Amy” Pond in the British science fiction series Doctor Who. Scottish actress and former model Karen Gillan was born November 28th 1987. Before Gillan became an actress, she was scouted by a modelling agency. Gillan worked as a model in 2007’s London Fashion Week for designer Allegra Hicks’ autumn/winter catwalk show and the launch party of Nicola Roberts’ Dainty Doll Make-Up Range. This was shown in Roberts’ episode of the documentary, The Passions of Girls Aloud which premiered on 4 April 2008. Gillan has said she would not give up her acting career to return to modelling. She stated that she enjoyed modelling but acting was always her main interest and goal. Gillan’s early television acting career included guest appearances on several drama series, with her first ongoing role being a two-year stint as a member of the ensemble cast of the sketch comedy series The Kevin Bishop Show in which she played multiple characters, as well as celebrities such as Katy Perry and Angelina Jolie. She appeared in Channel 4’s Stacked; she had the part of Ginny. Gillan also appeared on TV in a leading role in a horror project entitled The Well, which was broadcast as a series of episodic short films on BBC Two, and then later also as a web series on BBC.co.uk. Part of the BBC’s multimedia “switch” programming, the short episodes interconnect with online games that further explore the environments presented in the series. She was cast for the role of the Eleventh Doctor’s first companion, Amy Pond, on the British sci-fi series Doctor Who in May 2009. She made her first on-screen appearance as Amy Pond in “The Eleventh Hour” with her cousin Caitlin Blackwood portraying a young Amy Pond.She was confirmed in Issue 420 of the Doctor Who Magazine to be appearing in the 2011 series. Gillan had appeared in Doctor Who once before in the 2008 episode “The Fires of Pompeii” in the role of a Soothsayer. Gillan made her first theatre appearance playing the role of Shirley in John Osborne’s play Inadmissible Evidence along with Douglas Hodge which debuted at the Donmar Warehouse on 16 October 2011.In August 2011, it was announced Gillan will star in an indie comedy called Not Another Happy Ending along with Emun Elliott. During an interview at the 2011 San Diego Comic-Con, Gillan revealed she will be returning to Doctor Who for its seventh series. On 15 December 2011, it was announced Gillan and Arthur Darvill (Rory Williams) would be leaving Doctor Who during the seventh series in 2012. [ On 26 January 2012 Karen Gillan played the part of supermodel Jean Shrimpton in the BBC Four film, We’ll Take Manhattan which told the story of Shrimpton’s relationship with the photographer David Bailey. She has also been cast as Brittney in a re-working of William Shakespeare’s Romeo and Juliet called Romeo & Brittney by David Baddiel. She has also been cast in a supernatural horror pic called Oculus as one of the main stars and has also been cast in comedian Charlie Brooker’s TV series A Touch Of Cloth. Amy Pond (Karen Gillan) left Doctor Who during the seventh series after encountering The Weeping Angels in New York (Don’t blink, Don’t look away and don’t blink) in a rather poignant episode . Warner Bros. upcoming Superman reboot “Man of Steel”, Directed by Zack Snyder, is due in cinemas in June 2013, with Production being “godfathered” by Christopher Nolan, who has just completed his own highly successful series of Batman films with Batman Begins, The Dark Knight and the The Dark Knight Rises. The film stars British actor Henry Cavill as Superman and also stars Amy Adams as Lois Lane, Russell Crowe as Jor-El, Kevin Costner as Jonathan Kent, Michael Shannon as the villainous General Zod and Laurence Fishburne as Daily Planet editor Perry White. There is also speculation of that “Man of Steel” could also Tie-In with a forthcoming Justice League of America film. When quizzed by the the New York Post about links to the 2015 Avengers-style film director Zack Snyder hinted that Man of Steel could be used to set up a proposed Justice League movie. featuring Batman, Superman and Wonder Woman uniting in a single cause. Snyder’s comments have been widely interpreted as a clear sign that Warner will use Man of Steel as a launchpad for a series of linked movies set in the DC Comics universe, just as Disney’s Marvel Studios did with its selection of films (beginning with 2008’s Iron Man) in order to set up The Avengers Assemble. There is also speculation that Batman could show up in Man of Steel, possibly in a post credits sequence. During The Dark Knight Rises (Which is out on DVD soon) John Gordon-Levitt’s Gotham police officer John Blake played an important role, and there has been speculation that Blake could step into Batman’s role in the Justice League of America film, after Christian Bale had his rather interesting encounter with Bane (Tom Hardy) (Of course he could also be playing Robin or Nightwing). There is also speculation that one other actor from the Nolan films will do “something” in the JLA film and there are is also the prospect of many other forthcoming films to look forward to, with Iron Man 3, Thor 2: The Dark World , Captain America: The Winter Soldier and Guardians of the Galaxy being released in 2014, and Antman, the Avengers 2 and Justice League of America being released in 2015. The Hobbit follows the sometimes dangerous, but at all times exciting quest of home-loving hobbit Bilbo Baggins who joins the Wizard Gandalf and a company of thirteen dwarves led by Thorin Okenshield on a dangerous journey to the Lonely Mountain, to reclaim the kingdom of Erabor and the many treasures which have been stolen by the fearsome dragon Smaug. Along the way they encounter many hazards including Cave Trolls, Giant Spiders, Hordes of Orcs and Imprisonment by the Elves of Mirkwood Forest, as if that wasn’t enough something decidedly dodgy is also stirring in the Fortress of Dol Gulder, to the South-East of Mirkwood. Peter Jackson has also including some of the related material in the appendices of The Lord of the Rings and Unfinished Tales, in order to tell more of the tale of Bilbo Baggins, the Dwarves of Erebor, the rise of the Necromancer and the Battle of Dol Guldur. The story reaches its climax during the Battle of Five Armies, where The men of Dale, The Elves of Mirkwood, The Dwarves of Erabor, the Hordes of Orcs and the Eagles all try to reclaim the treasure stolen by Smaug. 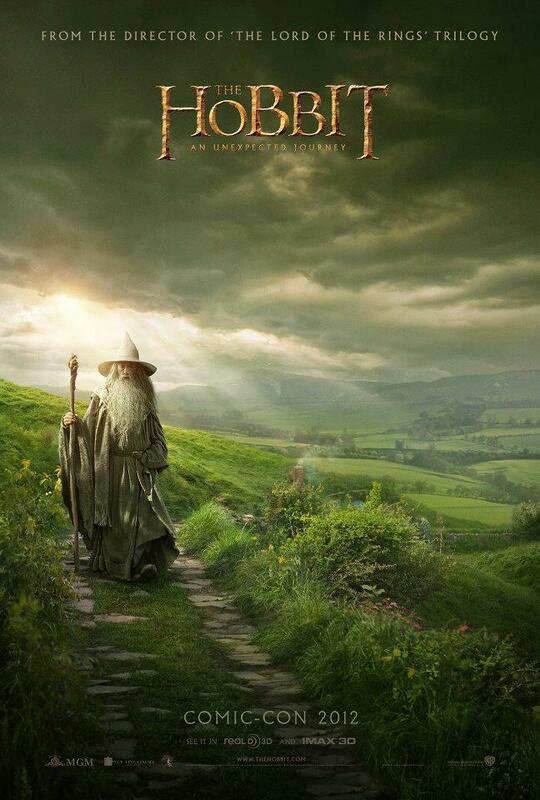 Thankfully Howard Shore is once again doing the Film Score for the Hobbit. I also found out recently that J.R.R.Tolkien got the inspiration for some of the landmarks in Middle Earth from Perrotts Folly and the Edgbaston Waterworks Tower, which are prominent landmarks about 600 metres apart in the Ladywood area of Birmingham and it is reputed locally that these towers are the basis of the `Two Towers of Gondor’ – Minas Morgul and Minas Tirith. In addition J. R. R. Tolkien also lived near Moseley Bog as a child, and this site is acknowledged the site as inspiration for the ancient forests in his books The Lord of the Rings and The Hobbit such as Fanghorn, Lothlorien and Mirkwood. Nearby Sarehole Mill and the surrounding area on the River Cole is said to have also been inspiration for Tolkien’s writings. This was once a secondary reservoir to feed the millpond of Sarehole Mill, but has since been turned into a nature reserve in the Moseley area of Birmingham. On 17 July 1991 It was declared a Local Nature Reserve (LNR) by Birmingham City Council & Much of the area comprising Moseley Bog was declared a Site of Special Scientific Interest (SSSI) in 1980. However, following its LNR declaration and re-evaluation by English Nature the site was denotified as an SSSI on 21 July 1992, but remains a locally designated Site of Importance for NatureConservation (SINC). The Wildlife Trust for Birmingham and the Black Country now leases Moseley Bog from Birmingham City Council.